From CDs to DVDs to Blu-ray, the media storage technology has moved to higher capacities and higher resolutions. A Blu-ray disc and player together provide content at full HD 1080p resolution. This is how they work. A Blu-ray disc is an optical disc format that is rapidly replacing DVD across the world. Blu-ray storage technology was introduced in 2006 and the name refers to the blue-violet laser that is used to read/write information on the disc. 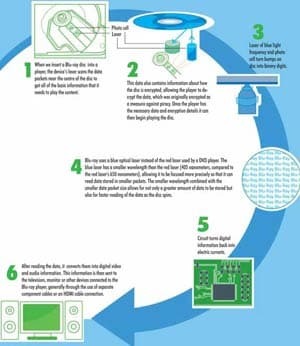 It was developed to enable recording, rewriting and playback of high-definition (1080P or Full HD) video as well as storing a greater amount of data and faster reading speeds. The format offers more than five times the storage capacity of traditional DVDs and can hold up to 25 GB on a single-layer disc and 50 GB on a dual-layer one. Translation: You can fit over nine hours of hi-def video or about 23 hours of standard-def video on a 50GB Blu-ray disc. Blu-ray disc doesn't work in normal DVD players. Blu-ray has a higher data transfer rate: 36 Mbps. over an hour and a half. Blu-ray discs are better protected than DVDs. programmes without loss in quality. You can record one programme while watching another on the disc. You can also create playlists; edit or reorder programs recorded on the disc; automatically search for an empty space on the disc to avoid recording over a program; access the Web to download subtitles and other extra features.